President Donald J. Trump has declared December 5 as a national day of mourning, calling on Americans to remember the vast contributions of former President George H.W. Bush. In remembrance of George H.W. Bush, the United States Postal Service will be closing their doors and suspending their regular mail delivery services on December 5th, 2018 in a day of mourning. To honor the life and legacy of President Bush, the United States Postal Service will observe the national day of mourning. While the United States Postal Service is providing limited pickup and delivery services for business customers, this has caused a panic for sellers, causing them to seek solutions to deliver their orders. Currently, the sellers are still trying to determine how it will impact their own packages and their marketplace metrics. 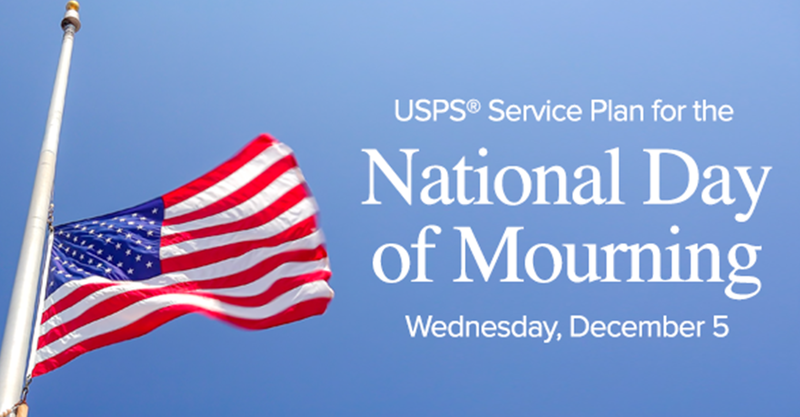 USPS notified all their customers that December 5th 2018 will be a national day of mourning for USPS in honor of former President George H.W. Bush. Due to this, USPS will not deliver or schedule pick-ups for USPS on December 5th 2018. As a result, USPS will not be available in Buy Shipping on Wednesday. Please purchase shipping from other ship methods that are available in Buy Shipping services. *** Please note, you will have to maintain Buy Shipping usage rate of 98% during this period. For questions or issues with your performance metrics as a result of this issue, you can reach out to sfp-performance@amazon.com. For all other Buy Shipping questions, you can reach out to buy-shipping-feedback@amazon.com. President Donald J. Trump has proclaimed Wednesday, December 5, 2018 as a National Day of Mourning in remembrance of former President George H.W. Bush. Out of respect for the 41st President of the United States and to honor his vast contributions to our country during his lifetime, and consistent with the Presidential Proclamation, the United States Postal Service will suspend regular mail deliveries, retail services and administrative office activity on December 5. Delivery – Regular mail delivery will be suspended, however there will be limited package delivery consistent with our Peak Season Sunday schedule. Delivery Destination Units (DDU) – Will accept drop shipments. Priority Mail Express Mail – Will be delivered. Retail – All operations will be suspended. Post Offices will be closed. Collections – Mail will be collected from boxes in front of Post Offices and high volume boxes that have a potential to overflow, while other collections will be suspended. Package Pickup – We will conduct scheduled package pickup requests. Plants – All plant operations , including Network Distribution Centers (NDC) and Sectional Center Facilities (SCF), will operate as scheduled except delivery point sequence (DPS) processing. FAST appointments will be accepted. Transportation – Air and Surface transportation operate as scheduled, and scheduled dispatches to Post Offices will occur. Business Mail Entry Unit (BMEU) – The BMEU/Detached Mail Unit (DMU) in plant locations will be open, while BMEU operations will be suspended at Post Office locations. Call Center – In operation but may have reduced staffing. Administrative Offices including Headquarters – These offices will be closed.